Aicok Slow Masticating Juicer Extractor is quite a popular, currently one of the better selling juicers on Amazon.com with its sleek and modern design and an efficient yet quiet motor. It scores 4.5 out of 5 stars by 153 customers’ ratings at the time of this review. The manufacturer offers you a long warranty of three years as they stand behind their good quality products. It is designed in the US and Europe but made in China like most kitchen appliances these days. 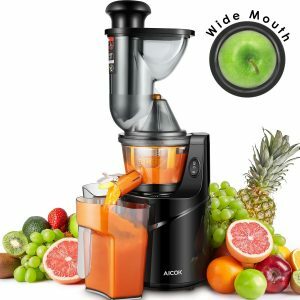 Black Aicok Slow Juicer weighs 12.2 pounds and measures just 7.2 x 7.2 x 19.5 inches- will not occupy a lot of space with its compact vertical design. You can either keep it on your countertop or you can easily move it away and store it in your cupboard as it will fit in most kitchen cabinets. It has a large 3-inch feeder chute for you to put in whole fruits without spending time on slicing or peeling. 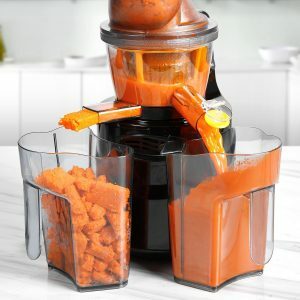 It saves you prep and cleaning time and this way you’ll have a tasty and nutritious cup of juice in less than a minute. You’ll get two containers, one for the pulp and one for the juice. It has an auger that runs at a rotating speed of 60 rpm while delivering you up to 20-30% more juice than centrifugal juicers. And it is not just about getting more juice either, because of no heat and much less oxidation the shelf life will be improved and the juice will contain more of minerals, vitamins, and healthy enzymes. It is capable of processing things like nuts (peanut and hazelnut butter), wheatgrass, carrots, leafy greens like kale and spinach and soft fruits and you’ll have no problem with juicing a variety of fruits and veggies. It includes a drip-free smart cap you can juice either one type of ingredient or mix a few and get a mixed juice. It will separate the pulp from juice very efficiently and the pulp is reported to be pretty dry. As an ETL certified juicer, the lid needs to be locked into its place with the locking arm for the juicer to run, so it is pretty safe to use. It includes a 150-watt power (110V-120V, 50/60Hz) heavy duty DC motor that lets you juice for ten minutes non-stop. You have to pause and have a little break after one minute of juicing with other models but not with this one. It runs quietly at 65 decibels of low noise and you will feel a lot fewer vibrations when it is juicing. In case the ingredients get stuck during the operation there is the security lock reverse function to help prevent this. With the easy assembly and disassembly, you’ll be able to clean it very easily under the running water with the cleaning brush provided. The parts separate from the base and you can wipe the base exterior and wash the containers and smaller parts. When you let it sit for a while the juice may separate due to any residual pulp, which is quite OK and you should just shake it up before using. You’re better off peeling the oranges before juicing so that you don’t get a bitter taste in your glass. Apple seeds can be slightly toxic but you shouldn’t worry about that here as the seeds will go into the pulp container. There will be a few residues and fiber in your glass as only the peel, thicker pulp and solids will be separated. So if you like your juice totally smooth you may want to strain it. The instructions may not be very clear for some people so the first assembly can be a little tricky and please lock the lid till you hear a click. But it gets the jobs done very well, has a large feeder, runs very quietly, produces as little foam as possible, generates no heat and is easy to clean with dishwasher-safe parts. Overall it offers superb value for money and we highly recommend it. You say it can run continuous for 10 minutes. The box says 30 minutes. The instructions say 1 minute. Which is correct? It says 10 minutes on the Amazon.com product page, but if you want more info please contact the seller directly through your order page via Amazon.com, thank you. Purchased Aicok Sd60 recently at Islamabad Pakistan. After few days of careful use Juice started leaking near spindle of auger. Due to my engineering skills i realised that the root cause is wear and tear of yellow plastic bush in the top cover causing auger to move up during running and causing malfunction. This bush should be made of metal instead of plastic. Please help! I just purchased the Aicok slow juicer #SD60K. How do you remove the separator to clean it – or is it stationary and cannot be removed? There is nothing in the instructions about how to remove it! Thank you! Please contact the seller via Amazon.com, thanks. Hi. What is the price of the juice machine CIF Dar es Salaam, Tanzania? How many kinds of fruits can it extract? Is it commercial or domestic?